Prayer and protest rallies were quickly organized on Tuesday in response to the horrific murder of four Jews in Jerusalem's Har Nof neighborhood by two Arab terrorists - a massacre involving guns, hatchets and knives which left eight others wounded, four of them critically. Deputy Religious Affairs Minister Eli Ben-Dahan (Jewish Home) spoke to Arutz Sheva ahead of a planned prayer rally for the wounded victims of the attack at the Kotel (Western Wall) at 5 p.m., which is to be attended by other MKs. "Remove the kid gloves and understand that we are at war," was Ben-Dahan's call in response to the brutal attack. "The government of Israel needs even this very day to expel the families of these murderers," Ben-Dahan said, referring to the cousins Uday and Rassan Abu Jamal of Jabel Mukabar who carried out the attack, and one of whom reportedly worked in a grocery store next to the synagogue where it occurred. Continuing his call for action, Ben-Dahan urged that the homes of the terrorists be demolished as well and not be allowed to be rebuilt, noting "only in this way will effective determent be created against the terrorists and their families and those who will return to murder Jews in the future." Regarding the incitement against Jews in the educational system of eastern Jerusalem where the terrorists hailed from, Ben-Dahan suggested the government get directly involved and change the educational system. "It cannot be that we allow Hamastan to exist right under our noses," Ben-Dahan remarked on the anti-Jewish incitement found in the Arab educational system in Jerusalem. Aside from the prayer rally, a protest rally is set to be held by the Otzma Yehudit movement associated with the Otzma Leyisrael party, as well as the Lehava anti-assimilation group. Former MK Dr. Michael Ben-Ari announced the protest on his Facebook page, where he wrote "Jewish blood has turned to water. Never again." At 7 p.m. Ben-Ari wrote that he and fellow activists intend to meet under the String Bridge near Jerusalem's Central Station at the entrance to the city, where they plan to demand the government take "revenge" for the victims. Another protest rally was also planned in light of the attack - this one outside the Palestinian Mission to the United Nations (UN) in New York at 115 East 65th Street. Three of the victims held US citizenship, and the fourth held British citizenship. The protest, organized by Rabbi Avi Weiss, the Russian-American Jewish Experience (RAJE) and several other Jewish organizations, is to be held on Tuesday at 12:30 p.m. local time. "This act of terror against Jews who went to a synagogue for morning prayer is despicable and the world must stand against the incitement of the President of the Palestinian Authority, Abu Mazen (Mahmoud Abbas) whose words have lead to terror. 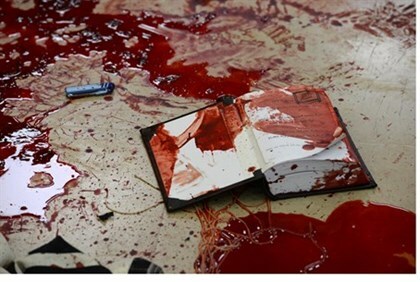 Jewish blood is not cheap," said Rabbi Weiss. The statement declaring the protest called for participants to bring Israeli and American flags, and noted prayers would be held in solidarity with the victims. Minister of Internal Security, Yitzhak Aharonovitch, responded to the terror attack in Jerusalem on his Facebook page. "Following the cruel terror attack at a Har Nof synagogue, I have instructed for the enactment of a number of immediate measures to be taken: placing security checkpoints in villages and scrupulously inspecting all those passing by; recruiting four Border Guard units; reinforcing the forces throughout the country; burying the terrorists outside of Jerusalem; suggesting to immediately destroy the homes of the terrorists…" the MK wrote.